Middle school is fraught with more than enough problems. You add the death of a father, a withdrawn version of her mom and Molly Williams is entitled to a whole lot of self-pity. But that’s not who Molly is and she doesn’t want to be known as “Miss Difficulty Overcome”. I love the author’s description of Molly on the back flap, a part of the book I often overlook. Baseball was always Molly and her father’s thing. She ends up going out for the boys’ baseball team. And making it. Not to be a rebel. Not to get herself noticed in an obnoxious, teenage angst kind of way, but because “playing catch” brings her closer to her father and helps her find a place of calm within herself. This book gave me chills! Just reading the inside flap brought those chills right back. 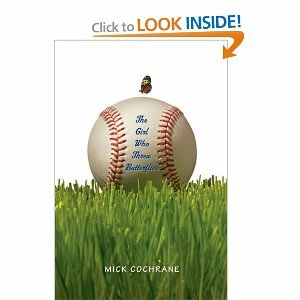 I never would have thought a book about baseball, even a girl playing baseball, could keep me as enthralled as I was while reading, but the writing is just amazing. “Molly understood that keeping score was a kind of storytelling, an almost magical translation of loud and dusty events in the world–” (p. 146). The last two pages of the book make me weep. Not in a horribly sad ending kind-of-way, but in the hope it gives me for my friend’s children who lost their father earlier this year. I know they are okay, but to read Molly’s words, it reminds me that there are all different kinds of okay. You can learn to be okay with a missing limb. “She would alwyas miss her dad. Always. That wasn’t ever going to go away. That had been an amputation. That limb was never going to grow back. It would always ache.” (p.176). Beautiful book, well-developed characters, a different take on sports and life. How can you not want to read this book?